On 29th january I visited the VDI Performance Summit which was organized by LoginVSI. 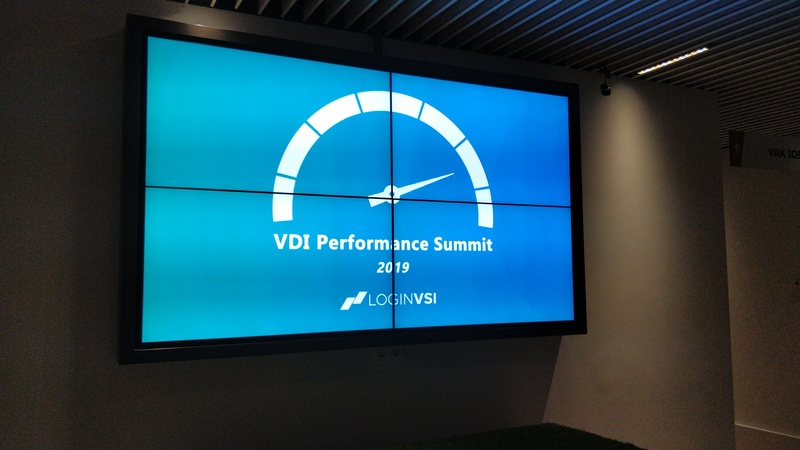 Login VSI provides performance insights for virtualized desktop environments such as Citrix XenApp, XenDesktop, Microsoft RDS and VMware Horizon View. 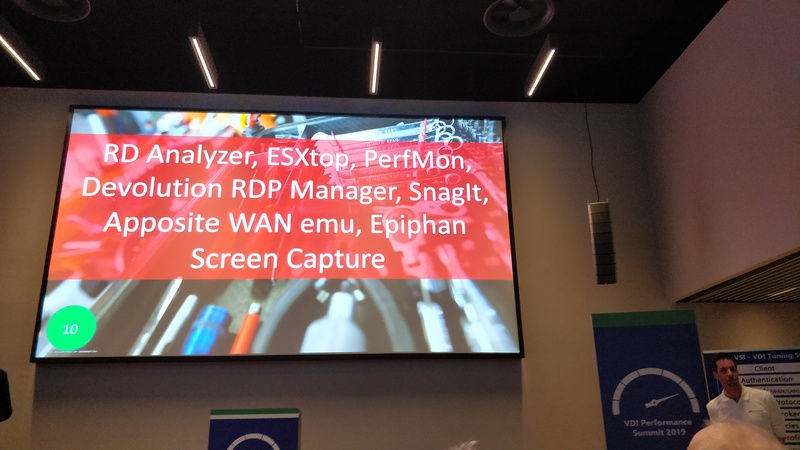 The summit was, of course, organized around the LoginVSI tool. 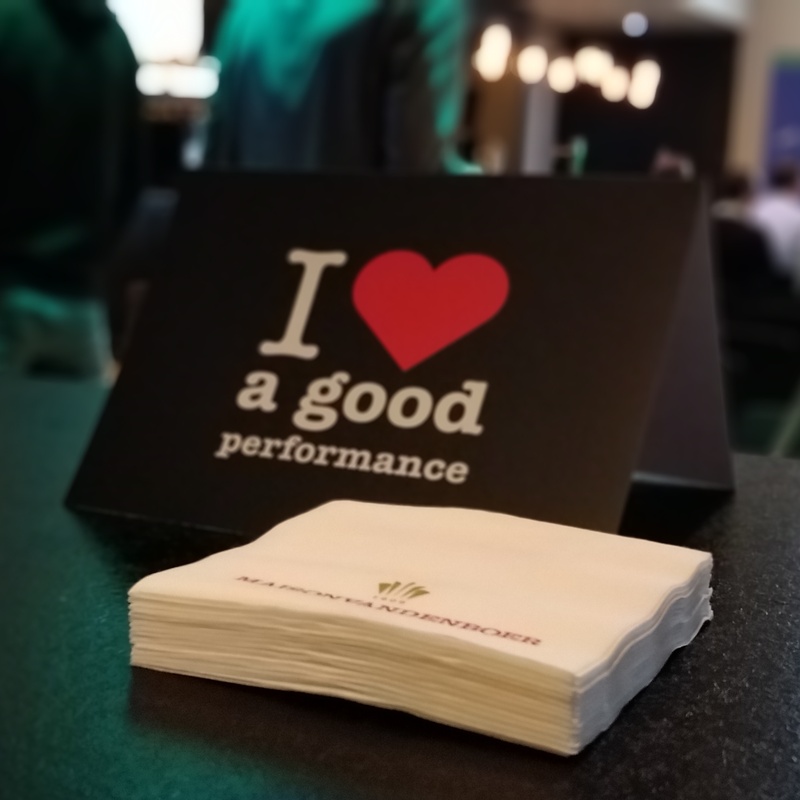 In this blog post I will tell you the 5 quick takes of the conference. When you put effort in repeatable tests, you can run the test several time’s and see if the performance of the VDI/SBC infrastructure is increasing, stable or decreasing. This is of course for each performance test, but I think in VDI environments it is not common to run a performance test each month or quarter. As performance tests are always about reducing risks in production. To avoid huge costs, a good scenario is to run the test against one host and see if you have the desired results in terms of response time and capacity for one host. With the introduction of Windows 10 Microsoft is releasing new versions of Windows more often. Mark Plettenberg presented the following sheet in his keynote. 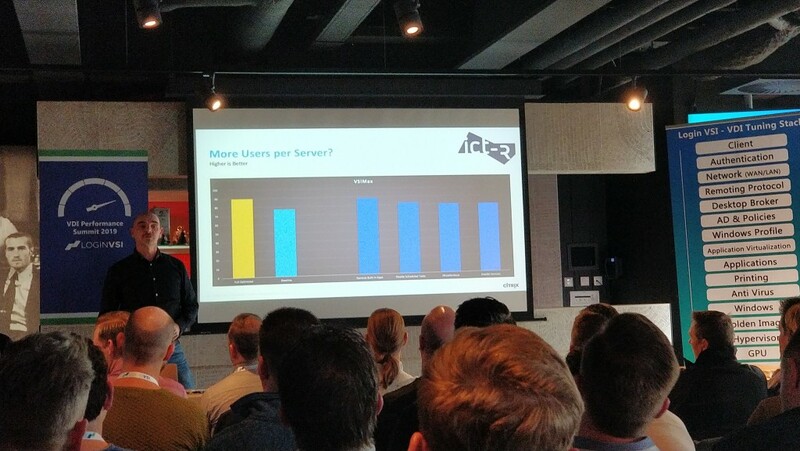 I found it really interesting to see the decrease in number of users per server. The decrease was also related to the Meltdown and Spectre patches introduced in those Windows versions. 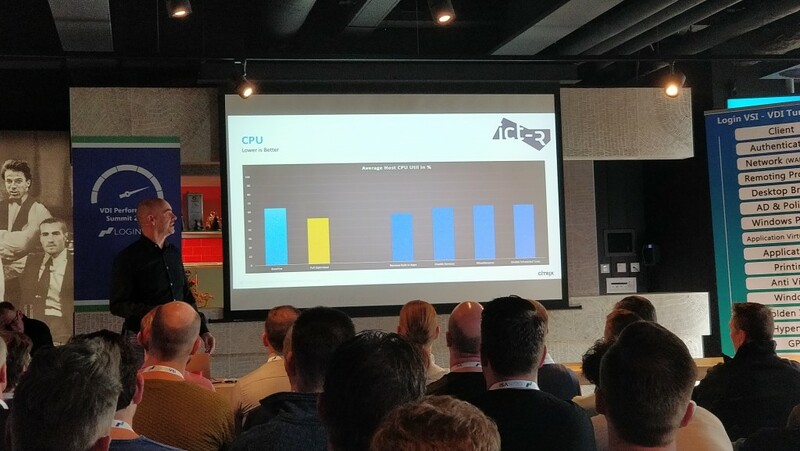 Rob Beekmans showed us that removing the built-in Windows App (all the games and other things you probably don’t need except the calculator) will give the most of the optimization. All the other minor things will not result in a huge improvement of users per server / and or lower the cpu usage. Someone, I forgot who said this, stated that in a performance test the background task of Windows will not run because the system does not get idle. So that needs to be considered before only implementing this optimization in a production environment. Servers running on a non-high performance profile in the BIOS / Windows settings will give weird results in the performance tests. 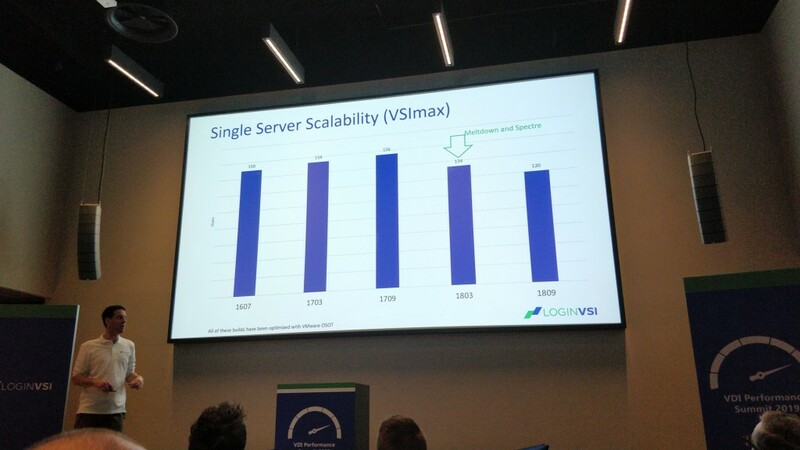 Run all the servers in high-performance mode, which is more economic and sustainable than adding more servers to the environment. 5. Which tools do the experts use to tune & prove the performance? 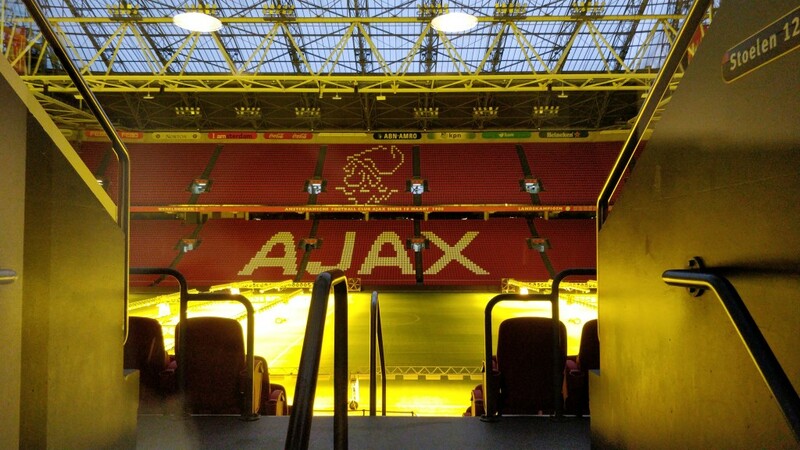 It was an interesting day in the Johan Cruijff ArenA and I hope that the event will be organized again with new content in an another year. Microsoft released App-V as an add-on for Windows in the MDOP (Microsoft Desktop Optimization Pack). So I also run App-V to have some hands on experience with applications on my Windows 8.1 and later Windows 10 installation. 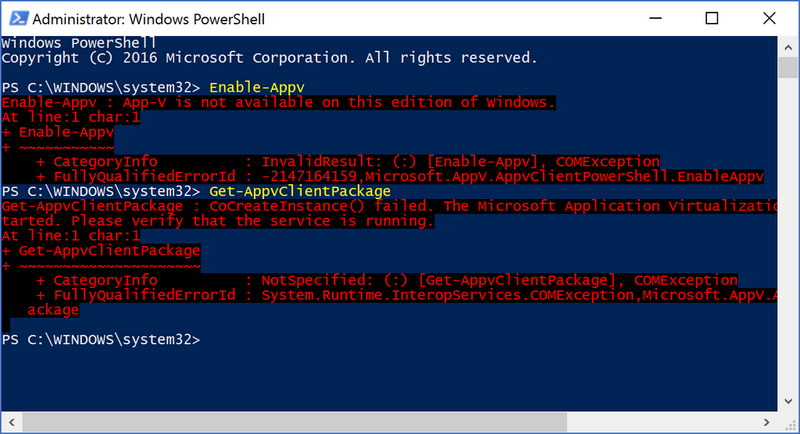 Last week I upgraded to Windows 10 Anniversary Update 1607, and I run in to errors with App-V applications. My Total Commander session lost all the configuration settings, slow starting or even not starting App-V applications. App-V is now part of Windows, but only for the Enterprise edition. I am running my private computers on Windows 10 Professional unfortunately. For me it wasn’t such a big problem for missing App-V, but the applications can not be removed as well without a running client. In this blog I will show how to enable the App-V client again. Be aware that this probably not allowed in the EULA, but you are at least able to remove the packages and stop using App-V. 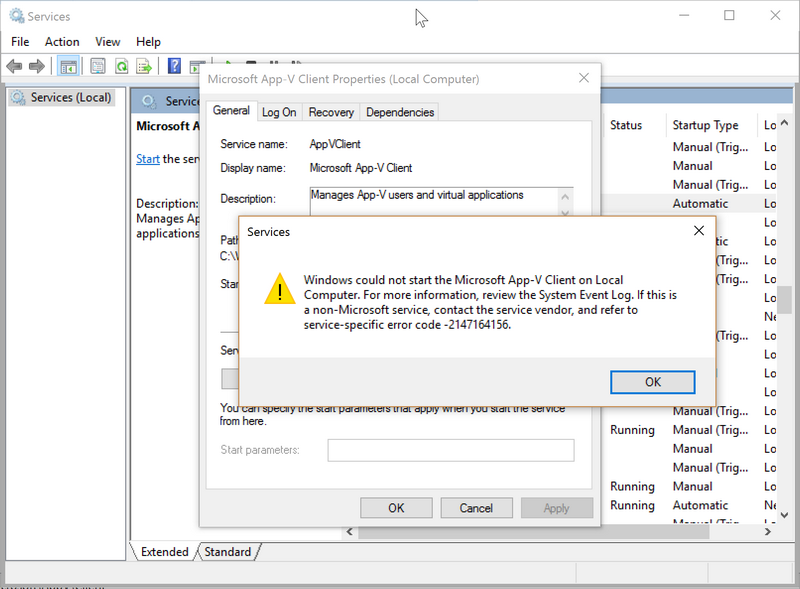 Starting the Microsoft App-V Client is not possible, even after setting the service to start manual or automatic. After this change the App-V client will start function, and you are also able to remove all the App-V packages and disable it again to be compliant ;-). Why to do test automation with PowerShell? To ensure the environment is stable and well-functioning all the time on the same way, I made a script to test the basic functionality of the virtual desktop image. The script also measures the time it takes to complete an action, so this can be used to set a baseline for performance measurement. Other actions can be scripted as well and added to the script. When the script has run completely with success it will ensure you that the basic functionality is still working. This video gives a quick overview what kind of actions are scripted and how it works. Workplace and VDI test automation with PowerShell from EasternNL on Vimeo. What kind of results do the script make? This file is tab-separated and can be imported in Excel or other tools for further investigation. Powershell version 3 or higher is enough to run this script. I am sure this will work on other platforms like Windows 8 e.g. as well. Basically it is simple, however in my coding some extra steps are involved to measure the start of Excel, and to make a screenshot to ensure everything went well. The Write-Transaction function is included in my module and will write the measured times to the .su file and take the screenshot as well. $transactionname = "Excel - start"
In the end of the script the complete .su file is converted to PDF format together with the screenshots. Windows endpoint testing, for VDI but also for physical desktop can be done with scripts. When launching every day, and eventually on different times of a day the performance and functionality of an Windows desktop can be measured. $testdocument = "$(Split-Path -parent $PSCommandPath)\testdocument.docx"
$testworkbook = "$(Split-Path -parent $PSCommandPath)\testworkbook.xlsx"
$printer = "Bullzip PDF Printer"
$transactionname = "Outlook - Start"
$outlook = new-object -com "Outlook.Application"
$transactionname = "Outlook - Write message in draft"
$mail.Subject = "$(Get-Date -format "yyyy-MM-dd HH:mm:ss") VDI Test Script"
$mail.Body = "Testing the VDI functionality with a script"
$transactionname = "Outlook - Exit"
$transactionname = "Internet Explorer - Start"
$transactionname = "Internet Explorer - www.eastern.nl"
Wait-InternetExplorer -ie $ie -text "Erik van Oost"
$transactionname = "Internet Explorer - Quit"
$transactionname = "Word - Start"
$transactionname = "Word - Open testfile"
$transactionname = "Word - Save testfile"
$transactionname = "Word - Print preview"
$transactionname = "Word - Print"
$transactionname = "Word - Quit"
$transactionname = "Excel - Open testfile"
$transactionname = "Excel - Save testfile"
$transactionname = "Excel - Quit"
$transactionname = "AppV - ContentStore"
$app = Start-Process cmd.exe -PassThru -ArgumentList " /k dir `"$($appvcontentstore)`" /ogneds" -WorkingDirectory "C:\"
$transactionname = "AppV Application Dymo Label Writer"
$message = "VDI Desktop Image testscript run on $(get-date -Format "yyyy-MM-dd HH:mm"). `n`nOutput PDF: $(split-path $outputpdf -leaf)`nComputername: $($env:computername)`n"
$message += "Clientaddress: $($sessioninfo.clientaddress) `nClientname: $($sessioninfo.clientname) `nClientversion: $($sessioninfo.clientversion)"